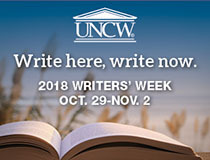 Each year, Writers' Week brings together visiting writers of local and national interest, UNCW students and members of the general public with an interest in literature and writing. Activities throughout the week include workshops, panels, and readings. Camille T. Dungy is the author of four collections of poetry, most recently Trophic Cascade (Wesleyan UP, 2017), winner of the Colorado Book Award, and the essay collection Guidebook to Relative Strangers: Journeys into Race, Motherhood, and History (W.W. Norton, 2017), a finalist for the National Book Critics Circle Award. She has edited anthologies including Black Nature: Four Centuries of African American Nature Poetry. Her honors include NEA Fellowships in poetry (2003) and prose (2018), an American Book Award, two Northern California Book Awards, two NAACP Image Award nominations, and two Hurston/Wright Legacy Award nominations. Her poems have been published in Best American Poetry, The 100 Best African American Poems, and more than thirty other anthologies. She is a professor at Colorado State University. Check out the Writers' Week Facebook page! Connect with us on other social media. Randall Library supports Writers' Week 2018. Find books by our featured authors in the Library's general collection using this digital gallery!